Thymic Protein A is a useful support for acute and chronic viral infections. Acute viruses include the cold and flu viruses in addition to other respiratory and gastrointestinal virus infections. Taken at the first signs of an acute viral infection such as generalized achiness, nasal congestion, sore throat, and fatigue (worsening of these symptoms acutely if they are part of the usual Lyme disease symptoms), Thymic Protein A can limit the course of the virus infection or may even stop it in the first 24 hours. For more information about acute virus infections see Keep This Cold and Flu Package On Hand For Fast Results. Some with chronic Lyme and associated disease also have active chronic virus infections (CMV, EBV or HHV-6) that contribute to the illness. Thymic Protein A can support the treatment of these viruses as well. However, treating these viruses requires six months or longer. Many healthy people have evidence of these three virus infections. Testing will help determine if these common viral infections are active enough to require treatment in a person with chronic Lyme Disease. For more information about testing for and treating chronic virus infections see When & How to Treat Chronic Viruses in Lyme: A Brief Guide. Thymic Protein A is made naturally by the thymus gland. 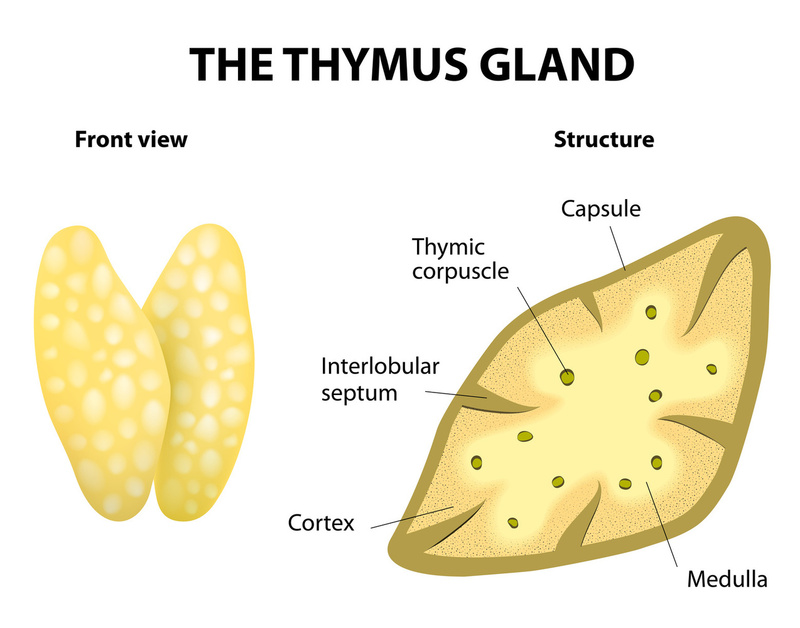 The thymus gland is an immune system gland located under the chest bone. In youger people it is quite active, but in adults the gland shrinks and becomes less active. Thymic Protein A promotes maturing of a type of white blood cell called a T4 cell. Once these cells are mature they turn on an anti-viral parts of the immune system including macrophages (see T cells and Macrophages in the illustration above). In this part of our immune system white blood cells attack germs directly through various mechanisms and kill germs like viruses and bacteria. Another indirect effect of of Thymic Protein A is to increase antibodies against viruses and bacteria. Antibodies are proteins made by type b white blood cells. Antibodies attach to a germ and attract white blood cells that kill the germ. Proboost is Thymic Protein A produced in bio engineered cells in the lab. The product does not consist of actual thymus gland. Acute Virus Infections: This is most effective if taken at the earliest signs of an infection but can help even if started in the first 48 hours of an infection. Take 1 packet under the tongue for 3 times a day for 2-3 days depending on how quickly the symptoms resolve. Chronic Virus Infections: Take 1 packet under the tongue 3 times a day for 6 months. Rosenbaum ME, Vojdani A, Susser M, et al. Improved immune activation markers in chronic fatigue and immune dysfunction syndrome (CFIDS) patients treated with thymic protein A. J Nutr Environ Med 2001;11:241–47.